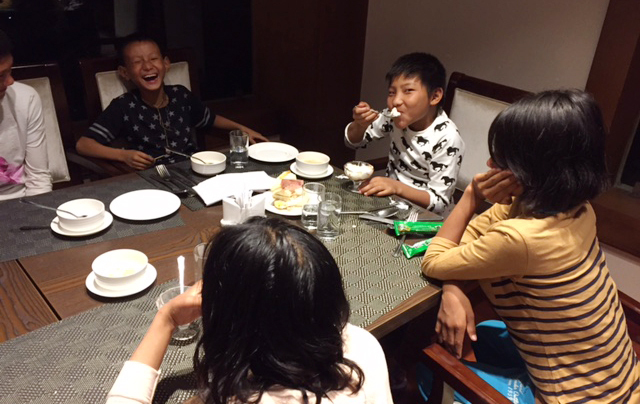 Ten boys and ten girls from remote Kheng village of Langdhurbi are currently in the capital city. They study at the Langdhurbi Primary School, Zhemgang. They come from such a remote place that only two from among twenty of them have seen a vehicle road before they came on this trip. More importantly, some of them are children whose fathers perished in a boat capsize that happened two years back. The idea of this trip was mooted to me by writer Chador Wangmo, during the 1st Annual Bhutanese Bloggers’ Conference in February, 2016. Given the humane story behind this idea, I proposed the idea to the Rotary Club of Thimphu whose members agreed to put together the logistical and financial support needed to make this happen. Thus this is one of the service projects supported by the Rotary Club of Thimphu, in collaboration with Ms. Chador Wangmo. Chador is currently busy acting mother hen to the twenty children who are being guided to many sites and sounds of Thimphu. The children are now here and they are loving the experience. There are many people and establishments that have helped make this a reality. A detailed account will be given later. 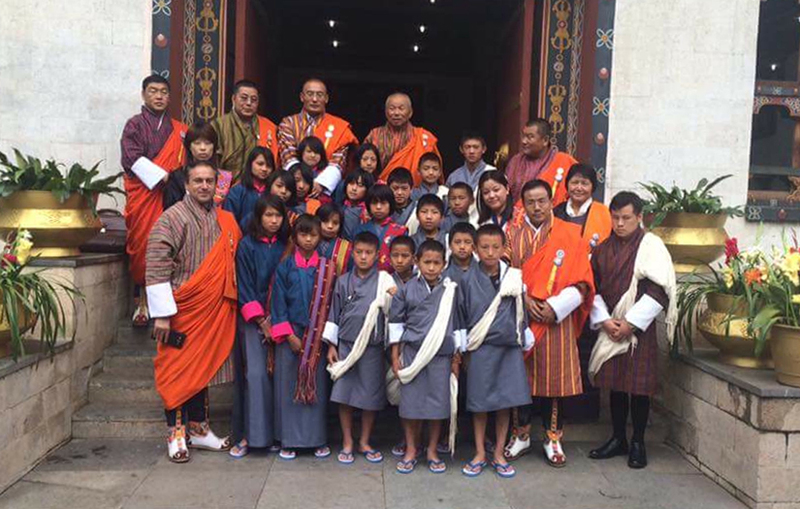 For now, the highlight of their trip has been the visit to the National Assembly where they met 7 of the 11 of Bhutan’s Cabinet, including the Hon'ble Prime Minister and the Speaker of the National Assembly. Yesterday they had lunch at the Hotel Jumolhari and they were served dinner at the Hotel Ariya - two of Thimphu’s most elegant hotels. Both the meals were served free by the hotels. Each of the twenty students received Nu.1,500.00 as spending money. When you look at the following photographs - remember these children come from a place where they have no roads - they have to walk for 7 hours to reach the nearest road head. As opposed to that, consider how wasteful and meaningless it is - that the government is contemplating the construction of the illegal Shingkhar-Gorgan road that will devastate the environment while bringing no meaningful benefit to any one. It will bring shame and disrepute to Bhutan and its claim to being a champion of environmental conservation. If the government has 700 million Ngultrums - that is what they will spend on the disastrous Shingkhar-Gorgan road - they should consider spending half that sum on the most neglected Zhemgang Dzongkhag - to bring road connectivity to the area. 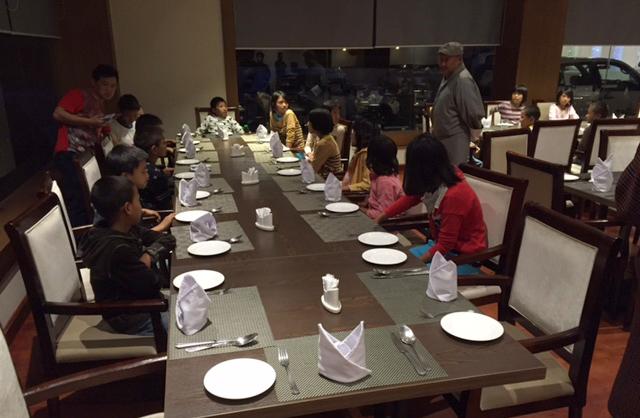 The children waiting for dinner at the Hotel Ariya. The clothing they are wearing were supplied free by some generous garment shops in Thimphu. The Rotary Club of Thimphu hopes to make this an annual event. 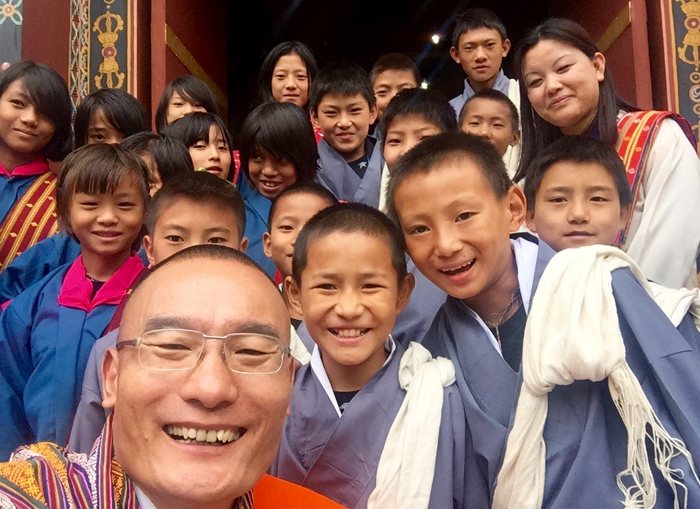 We want to bring other children from other remote Dzongkhags to expose them to the possibilities in life - to awaken them to what life can offer them. Jumolhari Hotel has already committed to be a partner in this initiative - for as long as the program is in place. We know that there are others who have the means and the will to make a difference in the life of less fortunate children who live stranded in remote places with poor access and no hopes of any dreams to dream. Thank you so much for this post, i am all happy teared seeing those happy kids. I am a silent and ardent follower and admirer of Au Yeshey's work. For me this could have been the best post had it not been mixed with "Shingkhar-Gorgan" road. I know Au Yeshey has been trying hard to instill some sense into the decision-makers concerning this issue. But this post - which was all about happiness for these children, even if for a limited time - getting suddenly mixed with the not-so-happy road issue spoilt the greatness of this post. I bring in the issue of the “Shingkhar-Gorgan” road to lend proper perspective to what is happening. Have you heard of the loss of ten lives in lower Kheng areas, caused by a ferry capsize that took place two years back? Some of these children lost their fathers in that unfortunate tragedy. A wife of one of the victims could not bear the loss and committed suicide, soon after. I bring in the issue of Shingkhar-Gorgan road because if the government had built roads and bridges in the Kheng areas, the loss of lives could have been avoided – because such unauthorized ferry service would not have been warranted. I bring in the issue of Shingkhar-Gorgan road because, despite the human suffering and tragedy, the government still does not speak of building roads and bridges in areas where none exist, and yet are willing to spend close to eight hundred million Ngultrums to build an illegal and unauthorized road that would not benefit anyone, while causing irreparable damage to the environment. 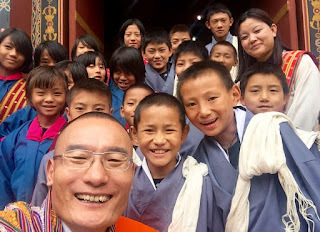 I am glad to know the happiness of those children exposed for exposure at the capital, Thimphu. Langdurbi is under Bardo Gewog and the GC road is under construction with trace cutting already reached gewog center. Probably by April of this fiscal year, formation cutting will be completed. Few individuals you i wish to acknowledge. 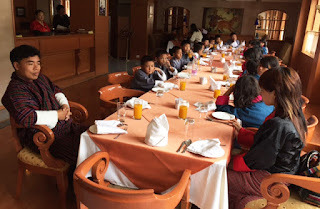 Mr.Sherub Gyaltsen for screening free movie (Wai Lama Kencho)at the city cinema.Folk heritage Restaurant,Druk Hotel,Simply Bhutan hosted meals.Dr.Lam Dorji and Karma Gyaltsen bought Gho & Kiras.Acha Dawa gave Nu.5000/- as spending money. Thank you all.